My dad thought I was born to play basketball. When I was seven years old, he sat me down and said, Pete, I'm making ninety-six dollars a week. There's no way I can put you through college. But if you'll let me teach you basketball, you'll get a scholarship. Maybe one day you'll play on the professional level as I did. Maybe you'll be on a team that wins the world championship, and they'll give you a big ring! My eyes lit up. I wanted that ring more than anything in the world, so I began a strict commitment to basketball. I played six to 10 hours a day during the summer. When my friends went to the lake to swim, I stayed in a 104-degree gym and worked on drills homework basketball, my dad called it. I went to bed with a basketball until I was 14. 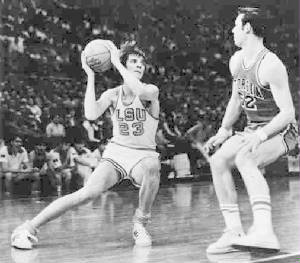 LSU's Pistol Pete Maravich still holds NCAA mens basketball records for the highest scoring average both per game (44.5) and for a career (44.2) as well as most points scored in a career (3667). I took my basketball into empty movie theatres and dribbled on the carpeted aisle during movies. I dribbled to and from town--five miles a day. When I got a bike, I learned to dribble while riding it and, later, while hanging out the passenger side of a car. But basketball wouldn't always be my obsession. I discovered beer at 14, and by the time I was 18, I was an alcoholic and a partier. The discipline was gone, and I played on raw talent alone. One weekend I partied with a friend all the way out to a Campus Crusade for Christ conference to perform the Show Time Clinic that my dad and I put on all over the world. When we arrived, I saw people holding hands, plucking guitars and singing about Jesus. I wanted out of there! But I couldn't leave, so for the next three days I heard about Jesus Christ. What He did and why He did it. When Bill Bright, Campus Crusades founder, gave a simple message about Christ and an invitation to know Him, hundreds of young people went forward. My friend, who was just like me, jumped out of his seat with tears in his eyes and gave his life to Christ. I rejected Christ that day. I wanted no part of it. I'm going to get my ring, then I'll have time for God, I decided. And I went back to LSU, averaged over 44 points a game, and in 1970 signed the largest contract in sports history. I sat at a press conference with Howard Cosell and 42 microphones and said, I've arrived! Now all I need is that ring! Then I will be happy for the rest of my days on earth. That was me, on the outside. But at the height of my popularity, I was miserable. I took up karate then got into Hinduism and reincarnation. I tried transcendental meditation, astro-planing, chanting and dabbled in the occult. I read everything on UFOs. I became a radical nutritionist then a vegetarian. I took life-extending drugs from eastern Europe because I wanted to live to be 150. Then I began thinking, what happens after 150? Why am I here? Is this all there is to life? I had rejected Christ at 19 and gone back into the wilderness, and I hated it. In 1980, I quit basketball out of pride and immaturity. I was so bitter I divorced myself from everything in basketball. I stayed home, changed my phone numbers and moped. That went on for two years. The fateful night in November 1982 started just like any other. I watched TV, grumbled in my $300,000 house, and went to bed about midnight. But I could not sleep. All the sins of my youth kept parading through my mind. This had never happened to me before. I was up all night. I cried out to God, suddenly remembering the gist of the prayer offered at that conference 17 years earlier. I asked Jesus to come into my life. Nothing gave me the peace that Jesus gave me that night. Pistol Pete was a magician with the basketball. I eventually got back into basketball. And when I finally got that ring with my name on it, do you know what Bible verse popped into my mind? "For what will a man be profited if he gains the whole world and loses his soul?" (Matthew 16:26). Do you have a brass ring you're striving for today? Take it from me, don't look anywhere but to Jesus, who gives a peace that lasts. Born: June 22, 1947 in Aliquippa, Pa.
Elected to Hall of Fame in 1987. It happened so suddenly. One minute he was enjoying playing basketball, telling a friend he felt great. The next, he was sprawled on the floor, his body convulsing in a seizure. An ambulance whisked him to the hospital where doctors tried for fifty minutes to revive him. 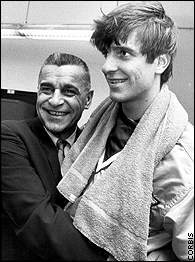 It was all in vain; Peter Press Maravich, known to the world as "Pistol Pete," slipped into eternity at 9:42 a.m. on January 5, 1988 at the age of 40. Noted for his mop of brown hair and floppy gray socks, Maravich scored more points in college than any other player in history. 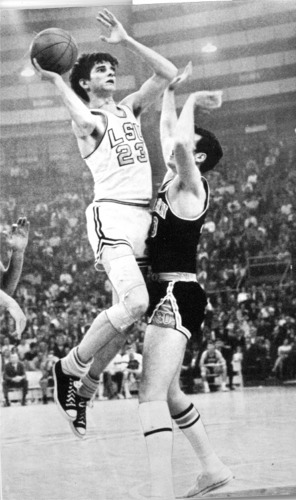 In only three years playing for his father Press at LSU, Maravich scored 3,667 points -- 1,138 points in 1968, 1,148 points in 1969 and 1,381 points in 1970 while averaging 43.8, 44.2 and 44.5 points per game. In the process, "Pistol Pete" set numerous NCAA, SEC and school records and was named a three-time All-America. In his collegiate career, the 6-5 guard averaged an incredible 44.2 ppg in 83 contests and led the NCAA in scoring three times. He also set an NCAA record by scoring more than 50 points 28 times. The 1970 College Player of the Year was selected third overall in the NBA draft by the Atlanta Hawks and wasted little time becoming a prime-time player by averaging 23.2 ppg his rookie season. After spending four seasons in Atlanta, Maravich was traded to the New Orleans Jazz where he peaked as an NBA showman and superstar. He made the All-NBA First Team in 1976 and '77 and the All-NBA Second Team in 1973 and '78. He led the NBA in scoring in 1977 with a personal high 31.1 ppg. Maravich finished his career with the Utah Jazz and the Boston Celtics in 1980. In ten NBA seasons, Maravich scored 15,948 points in 658 games for a 24.2 ppg average. His NBA single game high, a 68-point explosion, came against the New York Knicks on February 25, 1977.